Is your computer slow and full of errors? Easy PC Optimizer will fix common Windows problems, speed up computer performance and help you manage your files for maximum productivity. Let Easy PC Optimizer do the work while you sit back and relax! Learn more. * Clicking on the free download button will initiate the download and installation of Easy PC Optimizer (trial version). The trial version provides access to all of the app's features, but limits the user to scanning activities. I got it and am using it! I love it! Thanks so much! Easy PC Optimizer has saved me hours of tedious work it is well worth it.” I would recomend Easy PC Optimizer to anyone! What a fabulous tool. Thank you again! Thank you Easy PC Optimizer for finally giveing me control over my computer's startup preferences. My computer now boots up in record time. I am amazed by your program! I have suffered a twice daily crash at 10 am and 3 pm for many months, which no one seemed able to fix. After installing Easy PC Optimizer the problem vanished immediately! Why Choose Easy PC Optimizer? Easy PC Optimizer is an all-in-one Windows optimization tool with unmatched features and functionality. 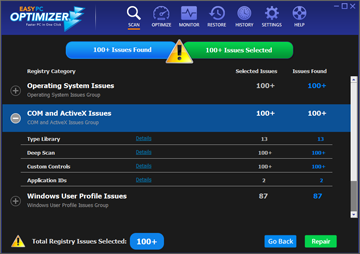 Click here to see how Easy PC Optimizer compares to its competitors.